The Barbican Centre is somewhat different to most other theatres in London, in that it stands outside the West End and is instead to the east of London. Whilst there is not a lot to do in the immediate area surrounding the theatre, the centre is equipped with its own restaurants and multiple performance spaces and is a destination in its own right. Liverpool Street is not far away from the Barbican area via tube, and is a vibrant and diverse area of London with plenty of additional restaurants, bars and boutique shops. By Tube: The nearest station to the theatre is Barbican on the Metropolitan, Circle and Hammersmith & City lines. The theatre is a 5 minute walk from here.By bus: The number 153 stops closest to the Barbican on Chiswell Street.By taxi or car: The Barbican Centre has four on-site car parks, all of which are clearly signposted from around the building. The Barbican Main Theatre is a unique design, where the seats almost surround the stage at all levels. There are a total of 1162 seats divided over four levels, each one set back from the other rather than overhanging like a traditional theatre. The rows in each section curve, meaning that a side on view is given by the first and last 7 seats in each row. Although this sometimes is an interesting way of viewing a piece, it is not for everyone. Because the theatre is modern in design, leg room is excellent at all levels. The Stalls have most of the seats in the theatre, with 50 seats in some of the larger rows. There are no aisles or divisions, meaning it can be a long walk for some people to their seats. As mentioned above, the extreme ends of each row curve around the stage and offer side on views of the action. Because of the angle of the stage, seats in the first few rows can feel a little low. Only choose these when discounted. Central seats offer the best overall value for money. The Circle is set back above the stalls but doesn't feel too far from the stage. the rows are long and narrow, with seats running down the edge following the curve of the balcony. There is a safety bar that runs the length of the circle, which is visible from all seats, although it is possible to maneuver oneself as not to be obstructed. The Upper Circle is much like the Circle, although is set back again further from the action. Seats at the extreme ends of the row curve into the stage and seem a lot closer than that the other seats in the section. The Gallery is the cheapest area of the theatre, although views are on the whole good value. Again a safety bar is visible in all seats, but tolerable the further back you are. Seats towards the end of the rows curve in and around the stage, overhanging the Circle. 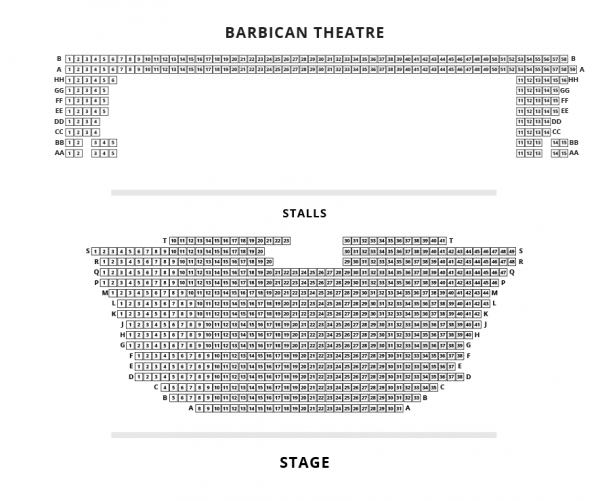 The Barbican is a modern theatre with 4 levels, all of which have significantly more legroom and more comfortable seats than some of the more traditional West End theatres. There is level access to all tiers of the theatre from the street, and lifts service each floor once inside the building. Concessions are available for all disabled patrons and their companions, and can be booked in advance. The theatre is very well adapted for wheelchair users, with lifts connecting all levels. There are 4 dedicated wheelchair spaces towards the rear of the Stalls and another 4 on row B of the Upper Circle, all of which have companion seats next to them. Scooters can be left in the foyer for the duration of a performance. There is an adapted toilet on the stalls level foyer next to the cloakroom, with an accessible restaurant and bar on each level of the theatre. The Barbican Theatre is part of the overall Barbican Centre complex, the largest performing arts centre in Europe. The Centre hosts a huge range of entertainment throughout the year including classical music concerts, live musicians, theatre shows, film screenings and art exhibitions, and is also equipped with facilities such as three restaurants, a library and a conservatory. It was opened in 1982 and is also the site for the London and BBC Symphony Orchestras. The Barbican Theatre itself is a large performance space capable of hosting up to 1166 patrons, and was initially built to be the home of the Royal Shakespeare Company. Unfortunately the RSC left the Barbican in 2002 due to a series of underperforming seasons, to concentrate on touring shows around London and the UK. In response, the theatre extended its then six-month run of international productions, the Barbican International Theatre Event, to a whole year. Today the theatre is keen to foster experimental and innovative theatrical events, merging dance, music and drama to create boundary-breaking and exciting productions. In recent years the Barbican Theatre has hosted shows including The Black Rider, Julius Caesar and Jack and the Beanstalk, and is due to present a number of workshops and festivals as well as plays in the forthcoming year. The theatre played a prominent role in the London 2012 Festival Programme, with several new productions commissioned for the Olympics season. In 2015 The Barbican presented Hamlet starring Benedict Cumberbatch, one of the fastest selling theatre productions of all time. 2019 sees the opening of Andrew Lloyd Webber's Jesus Christ Superstar.